Search and rescue dogs have sniffing down to a fine art. You wish your dog had a job that would cover his food, vet care and toys. Actually, some dogs do work for a living, using their super smelling, tracking and herding skills to make their handlers happy and keep the dog food rolling in. Detection dogs, or sniffer dogs, have made a career out of playing hide-and-seek. These canines have a master's degree in sniffing arts, and can easily find jobs working in airports, schools, commercial ports and postal service facilities. These super-focused dogs hunt for concealed bombs, drugs, weapons or farm products. When the sniffer dog hits pay dirt, he doesn't bark or howl with delight, but instead sits down quietly in front of his prey. This behavior gets him lots of praise from his handler but doesn't create a scene in public places such as airports. Although virtually any dog can join the sniffer dog ranks, German Shepherds, Beagles, Belgian Malinois and Labrador Retrievers are known as the “go-to guys” for this demanding work. Herding dogs have an uncanny knack for managing herds of unruly sheep or unmotivated cows. These high-energy dogs fearlessly run circles around the herd, moving them en masse to grazing pastures and back to shelter in their barns. Herding dogs operate mostly on instinct and intimidation, often staring down the larger animals like a police detective grilling a suspect. In fact, Border Collies have this cold-eyed stare down to a science, and they're recognized masters at the sport. Even with these world-class herding skills, though, they don't have the herding dog market locked up. The American Kennel Club lists 25 other herding dog breeds of all sizes and stripes. Search and rescue dogs often provide an “ace in the hole” for search teams looking for a missing child or overdue hiker. These volunteer dog and handler teams get their marching orders from emergency services and law enforcement personnel, and thoroughly scour a designated search area, often making second passes over already-searched ground. While a SAR dog is on duty, you'll typically find his nose buried in a pile of underbrush or sniffing the air for the missing person's scent. Search and rescue dogs also don't bat an eye if they're asked to search during a pitch-black night or in weather only ducks would enjoy. Because SAR work is so grueling, you probably don't want your Teacup Poodle or Yorkie out there. 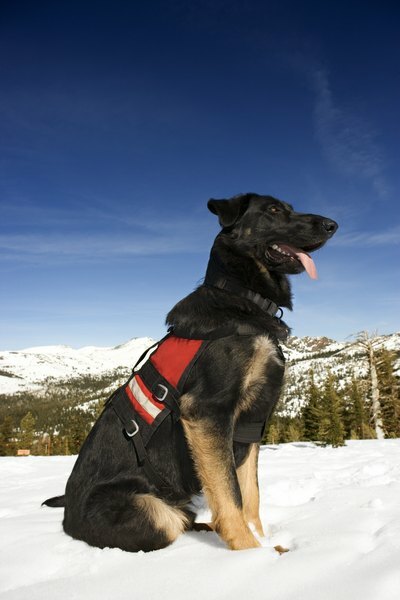 Larger, high-endurance breeds such as Golden Retrievers, Labrador Retrievers, German Shepherds and Rottweilers make up the gold standard for SAR work. Farmers with high-dollar alpacas, sheep and other pricey animals often recruit livestock guardian dogs to chase off predators looking for a tasty meal. A livestock guard dog gets up close and personal with his group, often sharing their digs around the clock. Instead of herding his animals, though, he protects them like his own puppies. This large, imposing canine keeps a watchful eye for coyotes, wild dogs and other predators, especially those mounting a sneak attack under cover of darkness. Great Pyrenees dogs are a natural fit for livestock guardian work, perhaps because their thick double coats enable them to live outdoors in any weather. You'll also find Komondors and Anatolian Shepherds guarding livestock worldwide. Precision K9: Types of Working Dogs: Truly Man's Best Friend! Animal Planet: Dog Training: Do Herding Dogs Automatically Know How to Herd? Can Dogs Live on Cat Food? What Is the Monthly Cost of Food for a Siberian Husky?